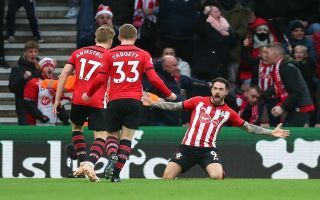 Arsenal were stunned by returning frontman Danny Ings in the first-half of their clash against Southampton, the former Liverpool star scored a brace. Unai Emery hasn’t found a way outsmart Ralph Hasenhuttl in his first home game in charge of the Saints so far. The Spaniard will be relying on Arsenal to deliver the kind of performance that has earned them the ‘second-half FC’ nickname this season. Danny Ings first stunned the Gunners in the 20th minute of the tie when he got in behind Laurent Koscielny to score an impressive header, Arsenal got themselves back into the game when Henrikh Mkhitaryan became the unlikely star to head in an equaliser for the Gunners. The game only stayed on even terms for 15 minutes, Ings scored a wonderful looping header in the 44th minute to restore the Saints lead – a devastating blow for Emery and the Gunners just before the first-half drew to a close. Koscielny is finished. Miss both headers which lead to goals. Should buy someone really good in January to have any chance of top 4 and Europa league. Yeah, this is embarrassing. They’ve won 1 game all season, so of course we’ve come bearing gifts. Thanks to Koscienly, he shouldn’t have played before the winter vacation. Look at what he was doing during both of the goals we conceded. Koscienly is nowhere near ready to be back in the first team yet. Why not give Medley or Monreal at CB a go? Koscielny time to go. Thanks for the memories. WE ARE LOSING TO 19th PLACE SOUTHAMPTON ?